Born and raised in Karachi, I started to bake when I was 8 years old. I taught my first solo class at 17, which I thoroughly enjoyed. It soon made me realise it is a wonderful way to make friends; food shared is a special kind of experience. We moved to Dubai soon after I was married and I managed to organise cooking demonstrations. This made my 6 years there enjoyable and memorable. Moving to Canada, it made my resolve stronger to start the same, my happy way of making new friends, who share a common interest enjoying cooking as much as I do. I enjoy doing fundraisers through my demonstrations, continuing to support a couple of charities through the years. Fortunately, my daughters enjoy cooking and eating, my husband is my source of truth and inspiration. My mum, who is a baker par excellence, does not hold back on her critical analysis, which has pushed me to excel. My brother, who started me off on this journey with positive encouragement, continues to be my ardent supporter. My Villie fui, who has taught me so much, having shared her own wealth of experienced knowledge that I would not be able to find in any cookbook nor cooking school in the world. But nothing would have been possible without my dad’s sincere belief in me. The bribing, cajoling and unconditional love started me off on this journey for which there is nothing but loving gratitude. I miss him every day but also know that he is smiling down while enjoying this journey with me! For my childhood friends who have always believed in me, thank you. Decades of passion and teaching cooking prompted me to start a blog. With so much technology at hand this success turned to experiment with writing e-cookbooks. My series are called Niloufer's Kitchen and available online on Amazon.com. 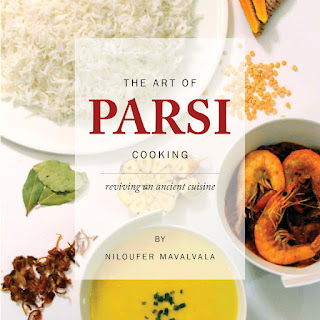 One thing lead to another and finally I have managed to release my first published cookbook The Art of Parsi Cooking; reviving an ancient cuisine. The journey has been an incredible one for sure. Being a teacher at heart, detailed explanation and generally writing how I would verbally teach is the format I have chosen. Trivia and Tips make it comfortable for the learner and the expert. It is an art form of narrating my life story perhaps. I hope you get a chance to browse through my books and enjoy them as much as I have putting them together.